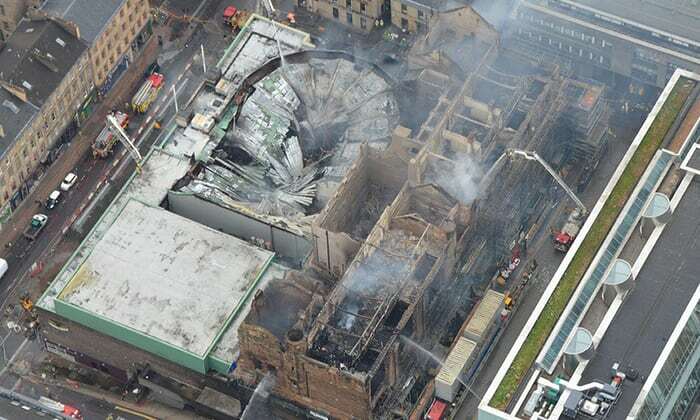 For the second time in four years, Glasgow School of Art in Scotland has been devastated by fire. A huge blaze broke out at the school Friday night that has been described by local officials and onlookers as “heartbreaking,” “devastating,” and “immense.” Images and video relayed via social media Friday night showed a towering inferno lighting up the Glasgow skyline, with embers and flaming debris raining down across the city as a thick plume of smoke filled the night sky. An adjacent nightclub also caught fire and was extensively damaged by the blaze. Ultimately, over 120 firefighters were deployed to the scene amid fears that the fire would spread to further structures. There were reports that responders were unable to enter the school to fight the blaze from within for fear of structural collapse as the fire reached temperatures exceeding 1000 degrees Celsius, or over 1800 degrees Fahrenheit, temperatures nearly hot enough to melt steel. The building’s structural stone columns were extensively damaged in the previous fire in efforts to save the building. By morning, the Grade-A listed structure could be seen gutted against the morning sun, with stone pillars and destroyed timber framing among the only remaining elements of the iconic, pioneering Arts and Crafts-style structure designed by Charles Rennie Mackintosh in 1896. According to The Guardian, the 2014 blaze was caused when flammable gases from a foam canister used for a student project were accidentally ignited and eventually spread throughout the structure through old ventilation ducts. Work on the restoration of elements destroyed by the fire—which included the school’s fabled library—was well under way as the latest blaze broke out. It appears those efforts have been in vain and that the renovated sections have suffered a total loss. Reports indicate that a new sprinkler and fire containment system designed to prevent further fires was in the process of being installed as the restoration pushed toward a late 2018 completion. AN will continue to provide updates on the situation in Glasgow as more information becomes available.